In contrast to the solid urban fill now encircling Jamaica Bay, we can see the remains of salt marsh islands scattered within it. Due to a combination of influences that include dredging and filling, upstream channelization, and torrents of treated wastewater and stormwater outflows, these islands are eroding at an ever-accelerating rate. Without additional acts of human intervention, such as remaking them with sand dredged from nearby shipping channels, the islands could completely disappear within a decade. Due in part to Post-Panamax channel deepening of the New York/New Jersey Harbor, an ambitious feat of logistical infrastructure networked from as far away as the Panamanian Isthmus, Jamaica Bay’s islands are now receiving a unique supply of restorative sand. The “cosmopolitan ecology” of Jamaica Bay is a vast microcosm exemplifying the broader extent of human agency on geologic and hydrologic cycles. Text book diagrams of these material flows typically separate hydrological processes (evaporation, precipitation, surface runoff, and the like) from the geologic (weathering, sedimentation, uplift), while subtracting human agency from both. Such diagrams are incomplete depictions of the full range of forces at work here, failing to illustrate how these cycles are deeply enmeshed with a multitude of distortive alterations engendered by our designs. Rather than geology happening predominantly outside of our influence, it is humans that are currently the earth’s preeminent geomorphic agents. Via our ability to direct and manipulate matter, we currently exceed the earth-moving propensities of rivers, glaciers, winds and plate tectonics. Globally, humans and our conscripted machines now move up to 45 gigatons of earth annually, with 10 of those gigatons consisting of undesigned feedback effects of our actions. Within the United States, it has been estimated that 30 tons of earth are moved per person every year. By contemporary land uses, more than 50% of Earth’s ice-free land area has been directly modified by human actions, the consequences of which ooze and cascade well beyond those directly affected areas. This anthropogenic co-making of geologic and hydrologic processes can be referred to as the dredge cycle. The dredge cycle is not limited to the transportation of underwater sediments via herculean shovels and wonders of industrial engineering. Rather, the dredge cycle implicates a far more extensive range of human encounters with sediment (image below). The dredge cycle includes both intentional acts of earthen manipulation, as well as a plethora of unintentional counter-actions feeding back upon one another. The dredge cycle accelerates and decelerates flows of sediments, as well as pollutes, transforms and cleans them. The dredge cycle is now ubiquitous and inseparable from what were formerly considered ‘natural’ formations. It is titled the dredge ‘cycle’ because it identifies recurring, self-organizing and ever-aggregating strings of events driven by anthropogenic influences. These cycles range from the absurdly Sisyphean, to adept strategies of sediment manipulation. From the 800,000 dams  around the world that now prevent one-third of all river sediment from reaching the oceans, to the profusion of erosion control silt fences that prevent loosened sediments from escaping construction sites, the dredge cycle recognizes humans as multi-scalar participants in the granular constitution of the earth’s surface. The dredge cycle is a navigation chart for this new generation of landscapes. [The Dredge Cycle (Dredge Research Collaborative)]. Dredging is a pivotal moment within the repertoire of dredge cycle operations. It is when we intentionally counter forces of gravity by scooping up rock and sediments and transporting them elsewhere. Dredging is an event of ‘forced uplift’ in which human intervention in the geologic cycle is at its most overt, when we take on the heavy and laborious work of reversing sedimentary processes, so as to construct or maintain essential services that support current settlement patterns. Dredging is enacted to maintain navigable depths of ports, harbors and shipping channels, to reclaim land, create sea defenses, and clean up toxic environments. Dredging is primal infrastructure, the malleable earthen substrate over which other support systems are built and operated. As such, dredging is perhaps one of the grandest landscape architecture projects in the world, yet it goes largely unrecognized as the design leviathan it is. Driven by a quantitative necessity from ever-greater manipulation of sediments, there is a contemporary shift away from 20th century linear–disposal operations to those that are more circular, intelligent and anticipatory of their own effects. The maturing process of dredging appears to have an awareness of its own doings — both its shortcomings and successes — and is responding accordingly. In response to this infrastructure’s concealed and somewhat impenetrable status, the Dredge Research Collaborative organized DredgeFest NYC, a public symposium and harbor tour held in the fall of 2012. In the years leading up to this event we had researched, documented and speculated on dredge landscapes, finding that many of the seemingly far-fetched designs we envisioned were actually already happening in analogous forms, often rather quietly. The world of dredging is full of fascinating instruments and massive engineered landscapes with which design communities often never cross paths. Additionally, those actors with practiced agency in the design and construction of these landscapes are typically not landscape architects. Thus with DredgeFest NYC we sought to bring together diverse and isolated disciplines operating within these realms, such as corporate practitioners, government agencies, scientists, theorists, industry experts and designers to see what we might learn from one another. We assembled this group with a public audience (which turned out to be equally diverse) to talk about dredging and its manifestation in the New York/New Jersey region. The ‘gritty’ experiment of DredgeFest was twofold: it was an investigation of the aggregate flows of sands, silts and clays within the U.S.’ densest and perhaps most polluted coastal metropolis, and it was also a catalytic mixing of disparate expertise, serving to reveal gaps, opportunities and shared interests amongst them. Envision corporate manufacturers of geotextiles being enthused by designers asking what additional shapes and uses geotubes might assume, or designers being awed by the landscape modeling and analysis techniques currently used by scientists and engineers. These moments happened. DredgeFest NYC’s format was structured by the dredge cycle itself in order to link dredging to its constellation of related processes, such as regional changes in land use, upstream watershed and urban stormwater management practices and climate change. The symposium was divided into three sessions, opening with Dredge and the Anthropocene, in which the U.S. Army Corps of Engineers, the NYC Economic Development Corporation, a geologist and a designer discussed the larger implications of ever-expanding dredging in an era defined by human agency. What are the operational and environmental limits to this hulking geologic infrastructure? This question led into the second session, Circularity and Feedback, where we examined new methods for working with sedimentary flows that integrate waste streams and operational contingencies. Here the EPA discussed design challenges encountered in implementing its Beneficial Use of Dredge Program, followed by private sector experts in environmental imaging who demonstrated the analytical and forecasting rigor required to design ‘soft’ and more responsive forms of sedimentary infrastructure. The final session, Regeneration and Public Participation, explored engagement with sediment as a more open-source platform for environmental regeneration. Tactics introduced included grassroots campaigns for citizen gardening of oysters (for the creation of reefs to stabilize channels and improve water quality) and efforts to bio-inhabit the industrial banks of Brooklyn’s Gowanus Canal. Just one month after the DredgeFest NYC symposium, hurricane Sandy ripped through the New York/New Jersey Harbor, sending surges of water and sediment through the city’s boroughs. In its aftermath, the symposium’s discussions on climate change and coastal resiliency took on a difference in meaning and poignancy. Sandy became a catastrophic and costly event for understanding the dredge cycle’s processes. Rather than being approached as a ‘natural disaster’ by popular media, Sandy was interpreted as at least partially made by us through alterations in the earth’s atmosphere. Just after Sandy, the New York Times published an article contending that beach nourishment – the industrial dredging and re-application of sand to keep dynamic coastlines locked where we have decided we want them – will become prohibitively expensive and technically unfeasible with sea level rise induced by climate change. In such futures we might simply run out of enough usable sand, considering that 80 million cubic yards of it have already been mechanically placed on 54 of New Jersey’s 97 miles of developed coastline, averaging out to a truckload of sand for every foot of beach. This is an example of the dark and vibrant feedback of the Dredge Cycle, where in many instances, the more we construct and reorder hydro-geologic and atmospheric flows on a grand scale, the more we ironically end up with less control over those very processes. At times like these we are forced to go back to the drawing board, or to our computational models, and reconsider our strategies. Climate change is perhaps the most vexing feedback we’ve engendered thus far, as the scales of effects are unprecedented. Process diagrams such as the dredge cycle are a method for articulating the expansiveness of networked ecologies, which in turn may lead to more effective siting of design interventions within them, be they political, material, communicative, or other. Such charts are inherently speculative and partial, a type of propositional geography that isn’t necessarily ‘the’ definitive authority on such dynamic assemblies of stuff. Rather, the charting of material trajectories opens up spaces and sightlines for more focused or detailed ontographies within them, “processes of accounting for the various units that strew themselves throughout the universe”. These diagrams are not teleological, as they are as multiplicative as they are reductive. As an example of an ontographic machine, the dredge cycle articulates “a profusion of particular perspectives on a particular set of things”, or perhaps a “practice of learning how to orient toward objects [bodies and things] ourselves” at varying scales, both larger and smaller than the single embodied instance of observation. Consider another massive microcosm, this one on the other side of the United States. Upper Klamath Lake is located on the eastern flank of the Cascade Range in southern Oregon. With a surface area of about 80,000 acres, it is considered one of the largest lakes in the United States. The lake is extremely rich in nutrients, or hypereutrophic. During the summer it is saturated with thick masses of cyanobacteria called Aphanizomenon flos-aquae, or ‘AFA’, which feed upon copious amounts of phosphorous in the water. These algal blooms turn the lake into an opaque, swirling kaleidoscope of deep emerald greens when seen from above (image at top of post). The recurring blooms and subsequent die-offs of AFA are correlated with degraded water characteristics of extremely alkaline pH, toxic levels of un-ionized ammonia, and lack of dissolved oxygen. Excessive phosphorous in Upper Klamath Lake is an effect engendered by changes in the Klamath Basin over the past century. These changes include widespread logging, drainage of wetlands and extensive water flow modifications associated with irrigation and livestock grazing. Altered land surfaces have accelerated erosion rates throughout much of the watershed and increased the inflow of nutrients. Most significantly, wetlands in the Upper Klamath Basin were reduced from 350,000 acres to 75,000 acres as they were drained, diked, and converted to agriculture. The alterations of the Klamath Basin are similar to those of many other US watersheds. The EPA currently estimates that 15,000 waters nationwide are degraded by excess nutrients. On top of nutrient overload from land alteration, are added nutrients from industrial fertilizers. Since the early 20thth century when techniques were developed to manufacture such fertilizers, extensive parts of Earth’s surface have literally become awash in reactive nitrogen. Expanding “dead zones” at the mouths of rivers, such as The Mississippi Delta, occur as vicious chain reactions set in motion by excessive nutrients. Globally, the amount of available nitrogen in the environment has doubled due to anthropogenic influences, while the amount of phosphorous has increased three-fold. Exactly what this plethora of liberated elements signals for current and future landscapes remains a speculative question. We’ve initiated a global diaspora of critical minutia without knowing where and how it will repatriate in various material assemblies. Future geologists will likely deem sediments enriched with nitrogen as the tell-tale strata of our Anthropocene era, as the distinctive isotopic signatures of reactive nitrogen derived from inorganic methods (rather than microbes) are found in sediments everywhere, including the world’s most remote lakes and The Arctic. Like the peculiar traces of iridium found in the earth’s 65 million year-old rocks — material evidence of a transformative collision with an asteroid — emergent strata laced with nutrients tell of an extensive transformation now underway. Widespread nutrient pollution continues to increase even while industrial fertilizer production is becoming more challenging, both in terms of energy required to manufacture it and declining quantities of base materials, such as phosphate rock. Similar to the cycling of sediments, the contemporary nutrient cycle is richly anthropogenic and ever-aggregating, feeding back on itself with us as the primers of the pump. Seen in aggregate form, the reality of ‘peak phosphorous’ is less a quantity issue and more a geo-spatial redistribution problem. Clever corporate ecologies have already begun to exploit these disconnections between nutrient sourcing and byproduct. For example, a major source of excess phosphorous comes from remnant nutrients in treated human sewage. Canadian corporation Ostera recently unveiled the world’s largest municipal nutrient recovery facility in Hillsboro, Oregon, where their “Pearl® Nutrient Recovery Process” reclaims phosphorus and nitrogen from wastewater via a patented process that transforms them into “Crystal Green®, an environmentally-friendly, slow release fertilizer”. Crystal Green® is endorsed by the Audubon Society and Robert Kennedy, Jr., who serves on Ostera’s board of directors. In a publicity photo featured in the Oregonian, Kennedy stands shoulder-to-shoulder with three other smartly-attired men, all of them standing remarkably close to a large open sack of Crystal Green® pearls distilled from human excrement. 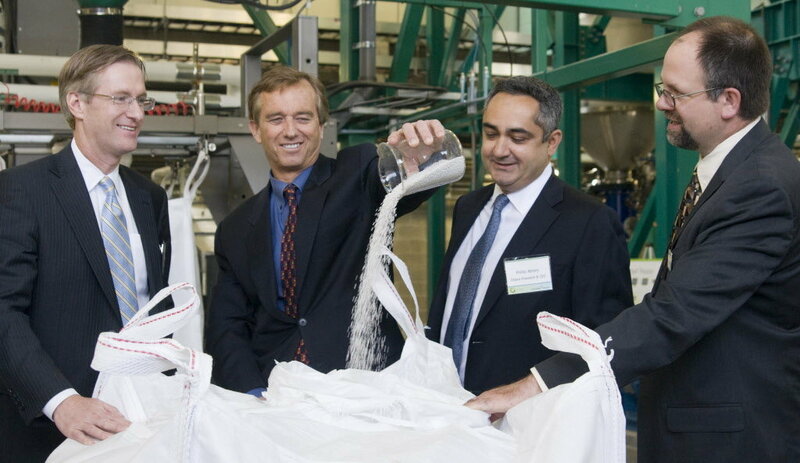 The three men are holding the edges of the sack open while a smiling Kennedy pours Crystal Green® pearls from a clear glass beaker into the bag. None of the men are wearing gloves. Ostera’s design strategy, performed within the engineered interior of a treatment plant, closes a bio-industrial loop-hole by coupling processes and operations which were formerly disconnected. A question more germane to the field of landscape architecture is what solutions and synergies are possible within landscapes themselves. Like the dredge cycle, the anthropocene’s novel flows and fluxes of nutrients are in need of speculative geographies that can better account for them, as well as new design frameworks able to respond to conditions of diminished resiliency within radically altered landscapes. In the Upper Klamath Basin, a variety of techniques are currently being evaluated to reduce excess phosphorous, methods that include mechanically filtering and harvesting phytoplankton with new instruments, dredging the lake’s phosphorus laden sediments, and the deployment of treatment wetland typologies. The latter technique, the design of landscape machines “made of landscape features and driven by landscape processes”, are being considered based on how they might be sited and chained together within the biophysical processes of the upper basin. 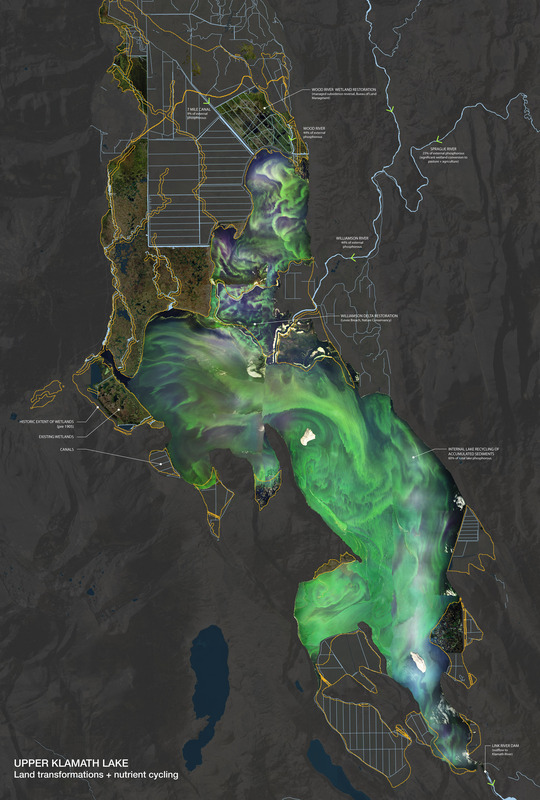 In the Klamath and elsewhere, the legislative grit of the Environmental Protection Agency’s TMDL requirements – whereby “Total Maximum Daily Loads” of pollutants, sediments, and nutrients are established for “impaired waters”, is becoming a generative code for a number of new and yet to be designed landscapes, particularly in light of just how many U.S. waters fall under this designation. The elemental features of landscape are unlike what they were just a century ago, a qualitative change we are deeply part of. The basic mechanical and biogeochemical cycling of material — be it carbon, toxic silts, phosphorous, or masses of cyanobacteria — now circulate within new routes and constituent associations. From these new formative cycles, a suite of new landscapes are coming on-line, both inadvertent and deliberate. The inadvertent variety typically arrive first, via the odd and sometimes disastrous feedback of these aggregating cycles, which then leads to the design of the deliberate in response to that feedback. We can see this in landscapes such as dredge disposal sites, which are morphing into a diversity of constructed dunes, beaches, aquaculture ponds, roadway base material, and decorative landscape products. Likewise, within this new granularity, wetlands are particularly fecund. Ignored or extirpated in the last century, we are now arriving at more expansive typologies and nomenclature of their dark and transformative otherness, all the while generating novel varieties, such as sewage treatment ponds or urban stormwater planters chock full of metals and exotic chemistries. New York City Soil Survey Staff, United States Department of Agriculture, Natural Resources Conservation Service, “New York City Reconnaissance Soil Survey,” 2005, http://www.nycswcd.net/files/RSS%20manuscript_06_08.pdf. Timeline estimates vary considerably for the full disappearance of Jamaica Bay’s marsh islands, from less than a decade to thirty years or more. The dynamics that characterize this coastal “sewershed” are still relatively unknown, thus prompting extensive research initiatives by the National Park Service. See National Park Service Jamaica Bay Institute, “Research Opportunities in the Natural and Social Sciences at the Jamaica Bay Unit of Gateway National Recreation Area” 2008, http://www.nps.gov/gate/naturescience/upload/JBAY-Research%20Opportunities.pdf. Kate Orff, “Cosmopolitan ecologies,” in Gateway: Visions for an Urban National Park, ed. Alexander Brash et al. (NY NY: Princeton Architectural Press, 2011) 50-73. Hooke, R.LeB., “On the Efficacy of Humans as Geomorphic Agents,” GSA Today, v. 4 (1994): 217, 224–225. Hooke, R.LeB., “On the History of Humans as Geomorphic Agents”: Geology, v. 28, no. 9 (2000): 843–846. Hooke, R.LeB., et al., “Land Transformation By Humans: A Review,” GSA Today, v. 22, no. 12 (2012), p. 4-10. Becker, Stephen, Holmes, Rob, Maly, Tim, Milligan, Brett, “Dredge,” in Goes Soft: Bracket 2, ed. Neeraj Batia and Lola Sheppard (Actar Press, 2013). International Rivers, “Damming Statistics”, 2011, http://www.internationalrivers.org/node/479. Welland, Michael, Sand: The Never Ending Story (Berkeley: University of California Press 2009), p.84. The full program for the DredgeFest NYC symposium is available at the Dredge Research Collaborative’s website: http://dredgeresearchcollaborative.org/dredgefest/. Cornelia, Dean, “Cost of Shoring Up Coastal Communities,” New York Times, Nov 5th, 2012, http://www.nytimes.com/2012/11/06/science/storm-raises-costs-of-shoring-up-coastal-communities.html?pagewanted=all&_r=0. Ibid. The cost of doing this was estimated at $800 million. Bogost, Ian. Alien Phenomenology, or What It’s Like to Be a Thing (Minneapolis: University of Minnesota 2012). p. 50. Stillwater Sciences, Riverbend Sciences, Aquatic Ecosystem Sciences, Atkins, Tetra Tech, NSI/Biohabitats, and Jones & Trimiew Design. “Klamath River pollutant reduction workshop—information packet.” Prepared for California State Coastal Conservancy (Oakland, California, 2012). U.S. Dept. of the Interior, Bureau of Reclamation, Klamath Office, “Natural Flow of the Upper Klamath River: Phase 1,” 2006. Environmental Protection Agency. National Aquatic Resource Surveys, http://water.epa.gov/type/watersheds/monitoring/aquaticsurvey_index.cfm. Alberti, Marina, Advances in Urban Ecology (NY NY: Springer 2008) 133-181. Gaia, Vince. 2012. “Leaving our Mark: Fossils of the Future,” BBC News, Nov. 2nd, http://www.bbc.co.uk/news/science-environment-20154031. Milligan, Brett, “Corporate Ecologies”, Journal of Landscape Architecture, Vol. 5, Iss. 1 (2010): 6-23. Ostera, “Clean Water Services and Ostara Nutrient Recovery Technologies Open World’s Largest Municipal Nutrient Recovery Facility,” 2012, http://www.ostara.com/news/news-releases/2012/clean-water-services-and-ostara-nutrient-recovery-technologies-open-worlds-l. There is no indication on Ostera’s website that the name Crystal Green bears any etymological relationship to Soylent Green, the popular 1973 science fiction film, despite overt similarities. Tims, Dana, “New Clean Water Services Facility in Hillsboro Turns Waste into Gold,” The Oregonian, May 8th, 2012, http://www.oregonlive.com/hillsboro/index.ssf/2012/05/new_clean_water_services_facil.html. “Upper Klamath Basin Water Quality Improvement Projects: Conceptual Feasibility Analysis” Forthcoming, March 2013. Roncken, Paul A., et al., “Landscape Machines: Productive Nature and the Future Sublime,” Journal of Landscape Architecture, Vol. 6, Iss. 1 (2011) 68-81. For additional information on The Clean Water Act and TMDLs, see The Environmental Protection Agency, “Impaired Waters and Total Maximum Daily Load”, http://water.epa.gov/lawsregs/lawsguidance/cwa/tmdl/index.cfm.